WITH the problem of climate change acquiring increasing urgency, activists are turning the heat on industry. In Europe, the aviation industry has become a target. 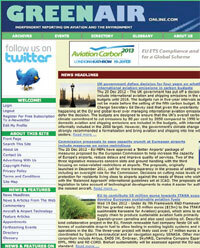 The website features reports and opinion pieces on issues surrounding aviation and its impact on the environment. It also features statistics from the aviation sector, mainly European though. The site looks at solutions from diverse angles. Whether you believe improved aircraft efficiency will provide the answer to air transport’s negative contribution to carbon emissions or that air travel expansion must be severely constrained in the battle against global warming, greenaironline.com has resources to draw you in.